This garlic naan with green chiles is pretty hard to not love. It's wonderful hot and straight from the oven, slathered with ghee (clarified butter) and sprinkled with Kosher or sea salt. I pretty much scarfed down the first piece while baking the rest of the pieces of this dough. Did you know that National Garlic Day is April 19? In honor of the day, the Bread Bakers group is baking loaves featuring garlic! After the recipe, you need to check out the rest of the links for breads with garlic... lots and lots of garlic. One of the main ingredients of naan is yogurt, which gives the bread a wonderful tartness. The dough is very stiff, and may strain your mixer, so be sure to pay close attention to prevent overheating of your machine. Hand kneading this dough is also an option, and is a great workout! Naan is normally baked in a tandoor clay oven, where it is placed on the side of the clay heated to 800 degrees F to cook for just a couple of minutes. I may not have a tandoor oven (hard to believe, right? ), but I do have an oven and a baking stone. This naan is flavored with garlic, jalapeno, mint, and dried minced onions. Trust me, it's so tasty. 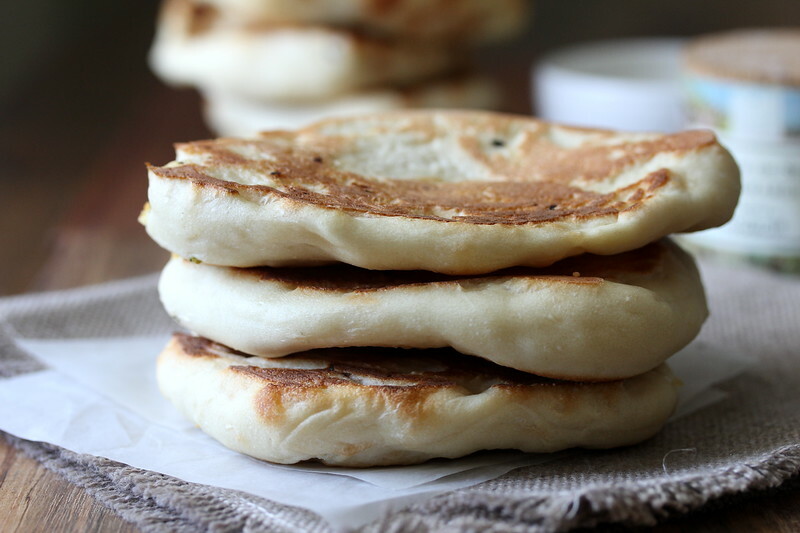 It's amazing how the little flat pancakes of dough puff up in the four minutes of baking. Add all of the dough ingredients to the bowl of a stand mixer. Mix on low for about two minutes until the ingredients are combined. Mix the dough on medium to medium high and mix for another five minutes, until the dough is smooth. The dough is very stiff. Place the dough into a large greased bowl, cover with plastic wrap, and let rise in a warm spot for about 2 hours, until doubled. Mix the filling ingredients in a small bowl and set aside. Transfer the dough to a clean work surface and cut it into 12 equal pieces. Form the pieces into balls, place them on a sheet pan, and cover with plastic wrap. Let rise until puffy, about an hour. With a pizza stone on the bottom rack, preheat your oven to 500 degrees F.
Press down lightly to flatten the dough balls and sprinkle them with the filling ingredients. Fold the balls in half and press them out into four inch rounds. Place four to six of the rounds on the hot stone and bake for about 1 1/2 to 2 minutes, until browned. Flip them over and bake for another two minutes. After removing them from the oven, keep them warm in a towel lined bread basket. Finish baking the rest of the rounds. Serve with ghee or butter, and Kosher or sea salt. Leftovers should be stored in an airtight container or plastic bag. They can be reheated on a skillet or in a hot oven. This recipe has been adapted from The Hot Bread Kitchen Cookbook. 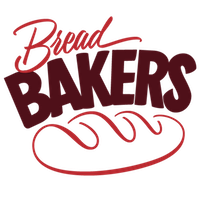 The Hot Bread Kitchen is a bakery in New York City that employs immigrant women and provides them with the skills to succeed in the culinary world. The book is amazing, and filled with a gorgeous collection of ethnic breads. If you love breads from around the world, you need this book. Read more about the bakery here. Sounds wonderful! I'm assuming the ingredient that is 620 grams is flour, but bread flour or AP? This bread looks so moist and delicious! I loved the theme this month Karen. Thank you so much for hosting us. We have quite a crowd! Thanks so much for the nice words Smruti! Karen hats off to you for being such a fabulous hostess! I loved the theme and am in awe of the hostess's graciousness and patience. Thank you once again. And there are no words to describe how beautiful your naans have turned out! Well-done! This means so much Georgina! You are so sweet. xoxo. 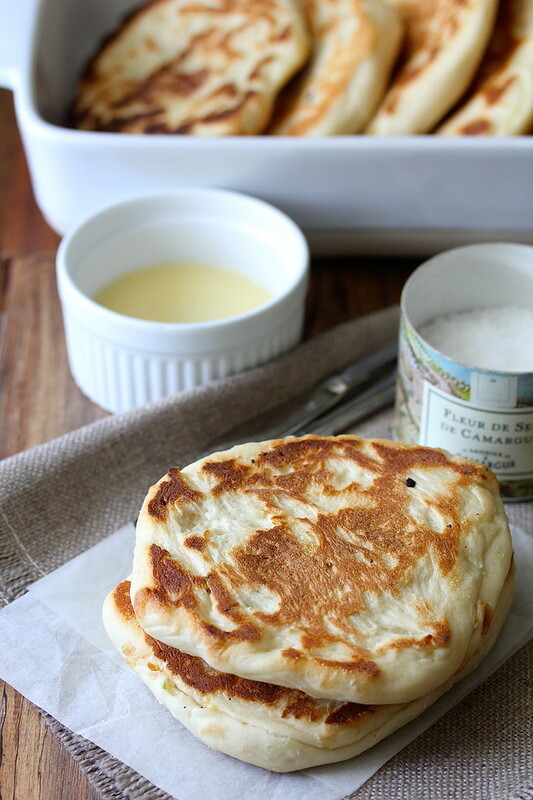 Naan is one of my favorites and adding garlic and green chilies sounds amazing! Thanks Heather! I don't know what took me so long to make it myself. 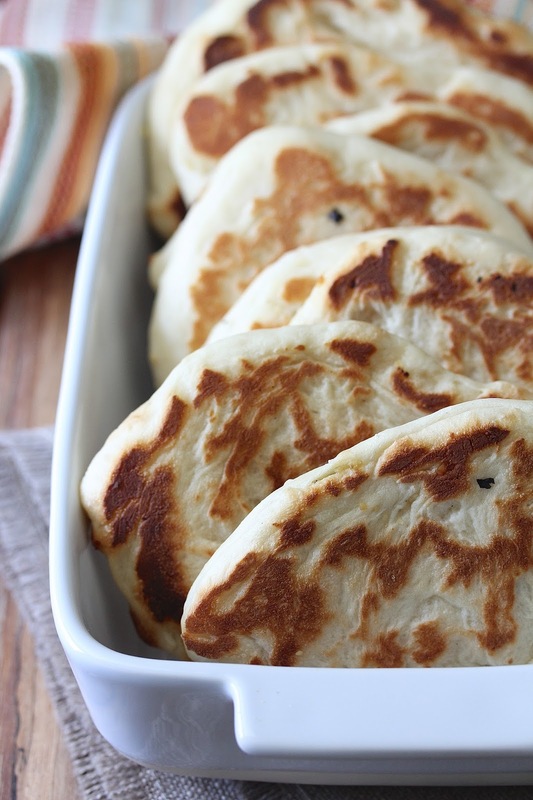 Oh my Gosh, these naans look so tempting! Love naan! These look delicious! Those look fantastic Karen! We loved how puffy they look, we bet they had some chewy texture as well, right? Thanx so much for the delicious recipe, this will be perfect with pantzarosalata, tzatziki or aioli! They do have a chewy texture! I need to check your blog for tzatziki recipe! Great dinner bread idea, thanks for hosting, Karen! So perfect for dinner, right? You had me at slathered with ghee, Karen. Every since Anshie insisted I needed to use it for my flatbread, I've been hooked. Love your fluffy naan! Thanks so much for hosting this month. Thanks so much for this group! Thanks for hosting, Karen. Your bread gives us all a great reason to bake again and to celebrate National Garlic Day! Simply beautiful! Your garlic naans look wonderful Karen!! I love the idea of adding an element of surprise and spice in the form of the chile! I bet they tasted out of the world - seriously, how could they not? Afterall, the main ingredient was garlic! Thanks so much for being the hostess and for the lovely theme. Garlic is one of my favourite ingredients to work with! Thanks so much Shireen. The chile mellowed quite a bit but still added that element of surprise. Loved these. I would eat three of those and then feel guilty for a couple of hours. Then I would go back and polish one more because I like even numbers. I cannot be trusted around naan. These naans are so soft and spongy, perfect to have with Butter Chicken. Perfectly made garlic naans Karen -- so soft and fluffy. Thank you for picking such a delicious theme for the month. I enjoyed baking my garlic bread and now have a ton bookmarked to try soon from the group. Your naan looks amazing. I can see why you ate the first one out of the oven, I would have done the same thing. Oooooo...I need to try this! We love naan and garlic, well, that's a given. Thanks Camilla! This is a new favorite! Loved this month's theme Karen. Thank you. Naan look super tempting as they look fluffy. Normally add garlic, chillis and fenugreek leaves but never tried with onion. Got to try it. Thanks Mayuri! I couldn't find any nigella seeds, so I thought I'd get creative. 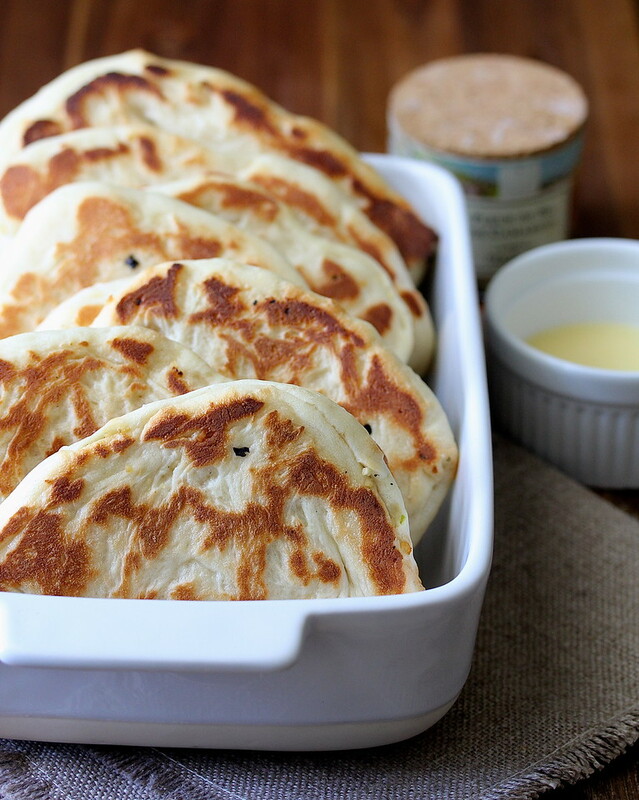 Those Naan look so look so fluffy and light, perfect!